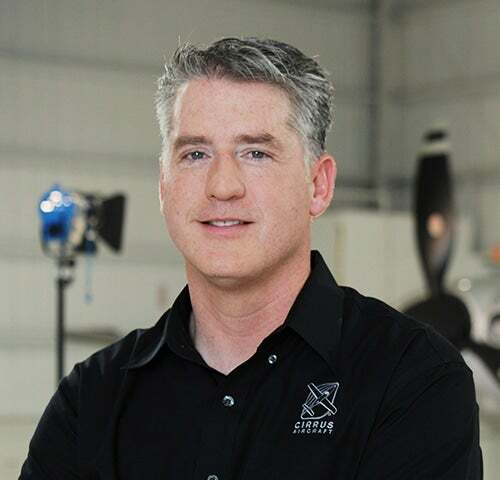 Patrick Waddick is President of Innovation & Operations at Cirrus Aircraft. He is responsible for leading enterprise-wide Innovation and Operations activities including research and development, engineering, program management, manufacturing operations, global supply chain and quality. Patrick joined Cirrus Design Corporation in 1988 contributing to the early engineering efforts on the model VK30 composite pusher-configuration aircraft. Transitioning from VK30 Chief Engineer to ST50 Project Engineering Manager, Patrick led a joint Cirrus and Israeli design team through to early flight testing stages. Patrick began his professional affiliations first with AIAA at the University of Wisconsin, Madison as a student chapter Vice President. In 2004, he was the recipient of the American Institute of Aeronautics and Astronautics (AIAA) Hap Arnold Award for Excellence in Program Management. Patrick is also a member of the AOPA and EAA aviation organizations. An active FAA Private Pilot since 1988, he holds a single-engine instrument land rating. Patrick was educated at the University of Wisconsin, Madison. He received a Bachelor of Science degree in Engineering Mechanics from the School of Engineering in 1989. During his degree program he completed a cooperative education internship with IBM Corporation in East Fishkill, New York.